christytomlinson: My Art Studio.. aka "garage"
My Art Studio.. aka "garage"
Tomorrow I have something FUN to share.. and a really fun giveaway too from the Gilded Life! So come back tomorrow afternoon for that! AND...just so YOU know.. I KNOW I have been a terrible blogger lately.. I swear it's only because of deadlines, deadlines deadlines. 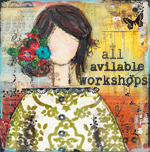 On-line Workshops, teaching events, my licensing products, magazine articles, (so excited to share that! I will be in two different Stampington Magazines this fall.. Somerset Studios and Artful Blogging! Can't wait!) . but honestly.. once the 3 Hearts workshop is over, and I am back from Texas (attending the Gilded Life Event!).. I will have some "down" time. Well sort of..(just found out today a fabric company and gift company want some of my designs from my agent.. so will be a tiny bit busy adding to those lines.. can't wait! wahoo!) but really just get to spend the summer with my kids.. camping, boating, being outside, creating art in the garage with them (that is one of their MOSt favorite things to do!). I LOVE summer. really do. And once the next few weeks are over.. my blogging will be back to normal. Also thinking of doing a new weekly series.. kinda like a challenge.. or something. (Not sure.. still working it out in my head). But gonna be fun! Just don't give up on me! I love my blogging friends and this outlet. You readers are the ones who warm my heart. Truly. You keep me going with sweet comments and heartfelt emails. It's so appreciated. I was telling my husband last night that I got an email from someone just yesterday. She just found out she had cancer this week, and also started my workshop this week. She shared with me some personal things and also how art has helped her heal and will continue to heal. It made me cry really. I get those types of emails and my heart just WARMS and surges and I KNOW I am doing the right thing. It's work and it's hard work.. but sharing my creative side, my ups and downs, my family.. my stories.. it's worth it. It helps ME connect with you.. makes me feel like I have all of these wonderful friends supporting me, loving me and going through exactly what I am too. Love that about blogs. Such a great way to create friendships and support systems. Anyhow.. totally off the subject. But just so you know.. you are so appreciated. TRULY. Well I hope you all have a wonderful weekend! This weekend, my brothers and sisters and I are getting together for a "mini" family reunion. To celebrate Memorial day. We had my dad's headstone installed last week and so monday we will all gather at his grave..with all the grandkids and write love notes on balloons and release them into the air. We will have over 40 balloons! Crazy huh? lol.. well with 7 brothers and sisters.. and big families.. (we all have a lot of kids) that is a lot of balloons! lol. gonna be fun. So this weekend they are all coming into town and can't wait to spend some fun quality time with them. Which means I better get off this blog and starting working so I can. here's my silly video :) ! Awesome video! I was DIEING to see where you create & how you video tape your work. Your authenticity is so refreshing. After seeing all the fancy work spaces in magazines like "Where Women Create", I felt a tad inadequate -thanks for setting me straight. I love your no-nonsense approach to life & work and once again, you have given me wings! I just found your blog, and I must say I really LOVE your art space! You have such wonderfull idea's of storing all the art stuff, I'm certainly gonna use some of your ideas! In stead of cutting off the legs of your chair, put blocks under the legs of the table. I work in an office and a lot of people have higher desks and chairs, so they can stand, or sit. I just adore your work! It was neat seeing your work space. Oh and you answered the biggest burning questions I had..."How in the world does she film overhead like that". Your hubby is indeed a genius! I tried putting a camera over my shoulder and didn't have great results so that is a brilliant idea. You can peek at my newest mixed media piece if you wish at the link I'm including. christy I absolutely love that you shared "where REAL women create". ha ha! our studios are not always pretty and full of fancy furniture, but the inspiration is always overflowing. have a wonderful day! ciao! OMG, thank you for sharing your space! It seems like sometimes I only see these elaborate fancy spaces that must have cost hundreds and hundreds of dollars to put together. They're crisp and white with perfect baskets and containers, and while they're beautiful, they don't have character where they appear USED and LOVED!! Love your space! Christy thanks for sharing, anytime I watch one of your videos' you just make my day. I love the carts. Love, love, love your space. It's perfect. I don't often find spaces that appeal to me. Some are way too clean and tidy and put away. Looks like a regular room in the house. I have to be able to see my stuff or I forget what I have. But on the flip side, if everything is out and exposed I can't find what I have. I think you have a PERFECT solution. I LOVE IT! Thanks so much for sharing your space. Thanks for sharing your space. It's a wonderful space that you can create it, and you have such supportive family who help you get more creative! Those carts are to die for! My 2 year old grandson was sitting on my lap watching your video with me and about half way through I asked him, "what does Christy have in her art room?" He looked up at me with his huge twinkling dark brown eyes and said, "cool stuff"!! I agree!! Thanks for sharing your space Christy!!! My last house I too was in the garage and used a space heater to keep warm, brrrrr. Not good. I had an old antique table for my crafting. My husband put in those pre-fab counters from Lowe's and some plastic cabinets. When it was too cold I moved into the guest room on a card table and used plastic 12x12 drawers for my paper which spilled out into the hallway and onto the pullout couch. It got so bad there was only enough room to squeeze thru to my table, LOL. thanks so sharing your space!! love your work and looking forward to signing up for some of your ecourses very shortly! OMG. That's what we did for my Mom & Dad. Sent balloons to heaven in their favorite colors. My Dad was first. When Mom died we sent up balloons and then one in Dad's color with message written on it. Makes your heart feel good to see them soar to heaven. Don't forget to take pictures. I still send balloons up. Thanks for always being a bright spot in my mailbox. You are my favorite blog. Love She Art Girls. Wish I could take the Three Hearts, but being unemployed...maybe next time. I feel your pain when you share your Fibromyalgia. My good friend has had it for 20 years and my neice has just been diagnosed with it. I have been suffering with Frozen Shoulder in both arms since February. Hard to be in pain and unable to do things. My art makes my soul happy. God Bless.